Thanks for visiting our blog! My brother and I were just young kids when our parents arrived in Orange County from New York City in 1962. It was then, and still is a very magical place to live. I have a deep appreciation of the visionaries who helped shape the future of Orange County, and preserve the best of our past. Our communities have become one of the most desirable places in the world to call home. As kids, we grew up watching the new Orange County emerged from the old. We rode horses on the beach between Laguna and Corona del Mar and dirt bikes in the hills above Irvine Lake. I’ll never forget the smell of orange blossoms in the morning and the sweet taste of strawberries picked fresh from local farms. Today, Orange County continues to evolve and offer some of the best places to live, work, play, and visit anywhere in the world. Whether you follow our Twitter (@OCLand) or this blog, we’ll make it a point to keep you posted on the latest and greatest that Orange County has to offer, with a touch of exceptional fashion, design, food, architecture, and entertainment from across the world. The striking modern architecture of Fashion Island set the trend for stylish living and working along the coast while strawberry and bean fields gave way to South Coast Plaza and a new era of shopping luxury and choices. Simple beach bungalows on Balboa Island, in Laguna Beach, and along the Newport Pennisula once used for occasional summer retreats gave way and transformed into casual and comfortable year-round beach homes. The hills above Newport Beach, Anaheim, Yorba Linda, Tustin and Irvine were once pasture lands for cattle grazing. Today, they set the stage for fantastic estate homes with panoramic views of the Pacific Ocean and our surrounding mountains and valleys. Newport Harbor and Huntington Harbour offer safe refuge for some of the world’s most beautiful yachts and spectacular waterfront homes. John Wayne Airport grew from beginnings as a small military airport, then reinvented itself to serve local private aviation, then finally into a port-of-call conveniently linking us to the world. 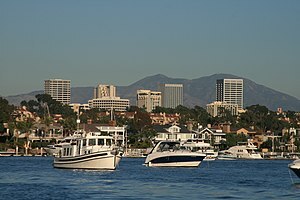 Take the commuter train along the coast to San Diego or up to Los Angeles and beyond for a relaxing sightseeing tour of old and new. The Orange County Performing Arts Center opened the stage for world-class live entertainment in 1986, while Laguna Beach kept its charm with art galleries and unique shopping and dining choices. From Brea to Seal Beach, Tustin to San Clemente, and everywhere in between there is always something to do see, and experience. Venues like the Honda Center, Disneyland, theaters, museums, galleries, and our many beaches, parks, hiking and biking trails, as well as world-class convention and exhibition centers ensure there is always something to do no matter what the mood or the kids call for. On any given day, sports fans can choose from a wealth of spectator events. From professional baseball and hockey, to surf contests in Huntington Beach, to motor sports, to college and high school competitions, to a pick-up game at the local park, the list is seemingly endless. Cities across Orange County continually re-invent themselves into new places to live, shop, work, and visit, with a solid footing on preserving the best of our past. Outdoor recreation and healthy living has been a part of our communities from its very beginning. From our signature coastlines and beaches to the numerous nature preserves set across out foothills, the diversity of outdoor recreation is nearly endless. Nearly 50,000 acres of pristine wildlands and parks were recently designated as permanent open space on The Irvine Ranch. No matter where you live in Orange County, you’re only minutes from a walk back into Orange County’s unspoiled wilderness. Or an hour’s drive into our local mountains for winter skiing or summer hikes. Our Mediterranean climate zone exists in only five small areas of the world: around the Mediterranean Sea, in central coastal Chile, the Cape region of South Africa, southwestern and southern Australia, and coastal California – including Orange County. The combination of balmy climate, nearby oceans and abundant natural resources means that our climate is unquestionably among the most desirable in the world. Today, as always, Orange County is truly one of the great places to live.